Kayla Burke, Spa Manager at Breathtaker on High Spa Retreat in Mt Buller. 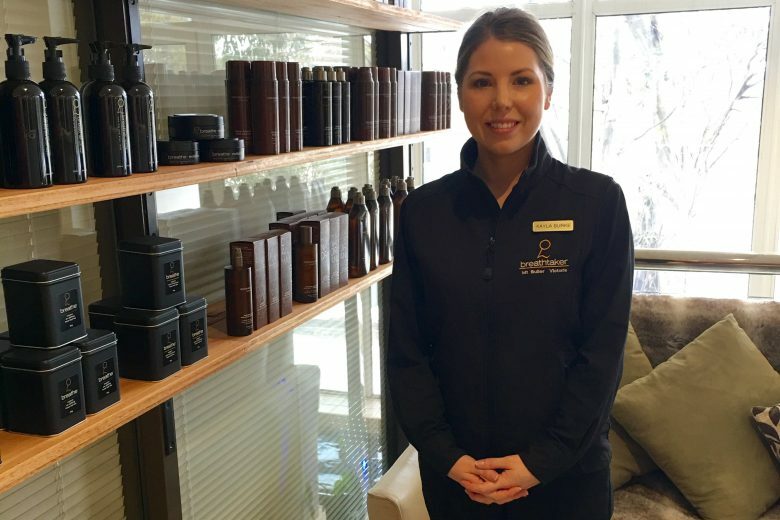 We visit Kayla Burke, Spa Manager at Breathtaker on High Spa Retreat in Mt Buller, to talk about the highs of working in a ski resort, the perks of being a destination therapist – and how you too can get this exciting gig! How long have you been working in Mt Buller for? This winter season 2016 is my first. I have held various roles in spa therapy, training and management within destination spas throughout Australia and Maldives. Born and raised in country Victoria, I’ve been travelling my entire career with my therapist qualifications – Mt Buller being one of my favourite destinations. That’s the best thing about our industry, it can take you anywhere in the world! Breathtaker is nestled on Mt Buller amongst the snow and trees. What types of therapists love working in a ski resort? A lot of therapists chase the snow, they’re interested in skiing or snowboarding and have grown up in that snow environment. You also need to be good at massage and have a passion for it. With snow sports being so physical, the majority of what we do is massage. Our therapists need to be experienced too; we have such a short season we have to hit the ground running. Do the treatments you offer at Mt Buller during the winter differ from what you might offer in a regular salon that’s not in the snow? In this type of climate, our treatments are designed to stimulate and aid in recovery. Think sore muscles and aching joints! Our skincare brand Breathe has developed a Spa, Active and Skincare range based on the needs and requests from our guests. There is also a focus on facials due to the environmental factors that affect the skin – we have introduced Organic Nation skincare this season due to its significant hydrating properties. Breathtaker’s new skincare brand Breath is rolling out into other spas across the globe. Are there any treatments you can’t do so high up in the mountains? We have a strong repeat clientele that visit Breathtaker Spa each year however we generally only see our guests a handful of times during their holiday. Due to this, we unfortunately cannot provide treatments such as medical peels or those treatments that cause a period of downtime as our guests want to spend as much time as possible enjoying the mountain. What skincare brand do you use? This winter season, we launched two new skincare brands for Breathtaker Spa – Breathe and Organic Nation. Both Australian made and owned, the two brands fit seamlessly with the concept and philosophy of Breathtaker Spa. Breathe was created to respond to individual spas and their specific environmental requirements and due to its success and exceptional feedback this season, the brand will expand its product range within the next 12 months. Our hero product from the breathe range has been the Active Massage Cream which is a blend of mountain pepper and menthol – perfect on the calves after a day of skiing! Organic Nation’s Hydrating Rescue Gel has been the most requested facial product from our guests. Therapists who gravitate to snow resorts tend to have an interest in winter sports, love the outdoors and have a passion for massage. What are the most popular treatments in a ski resort? Massage is our biggest demand – this includes all styles from relaxation right through to our sports active and remedial treatments. This season we have also introduced express massages, designed for the guests that want the quick fix in between their skiing. What do clients want most from their time at Breathtaker spa? At Breathtaker Spa, we pride ourselves in the complete spa journey. Our guests love the facilities – lap pool, spa and steam room that they have complimentary access to before and after their treatment to further enhance the benefits from their treatment. We offer our services and facilities to the hotel guests and also to anyone visiting Mt Buller. What are some of the benefits of working in a ski resort? The experience that you take away from working in a ski resort is second-to-none. The people you meet, the knowledge and understanding you gain from such a unique and remote lifestyle is invaluable. Other perks include discounts across the resort on lift passes, accommodation, restaurants and ski/snowboarding gear. Therapists in a ski resort get to enjoy all the winter sports Mt Buller has to offer on their days off. Do you live in Mt Buller just for the season? What is that like? Our spa staff live on the mountain for the entire winter season – from June to September each year. The living environment is a very unique experience as most staff accommodation is shared; it’s similar to a boarding house. The hours are long; we work from 8am until 8pm and in peak season we’re working six days a week. Also, we live where you work, which is something some people don’t deal well with. How do you deal with living where you work? It’s about work life balance. I like taking time out for myself with a hike or yoga – and being prepared is essential when you live in a remote environment. That means stocking up on comfort food, warm clothes and lots of vitamins! Regular trips off the mountain are also important to avoid cabin fever. The treatment rooms look over the snow at Breathtaker On High Retreat. Working in the mountains for the winter season brings life-long friendships as you come across people from all walks of life. It’s a place that you often bond quite strongly with your colleagues as you are spending a lot more time with them than usual – you live, work and socialise with them for an entire four months. How is working in the mountains different to working in a regular salon? The location and environment is completely different – we meet guests that are travelling from all around the world to see what Mt Buller has to offer. In their down time, staff also have the opportunity to experience what the mountain has to offer, such as cross country skiing, snowshoeing, tours with the huskies, heli flights or one of my favourites – hot chocolates by the fire. What are you planning on doing after the ski season ends? Some therapists chase the snow, others thaw out in Queensland. I am going to do some study this summer but next year I want to go to Canada, I’d love to go to Bamf. I’ll be back in Mt Buller next year! For other therapists who would love to get a role in a ski resort, what are your top tips to getting this great gig? There are resort companies who will post you around the world [ so get in touch with them]. You also need to have plenty of passion and dedication for your role as a therapist – extensive experience in massage a must. You should be willing to adapt to new environments and always strive to make a positive impact. And have a strong immune system; temperatures frequently drop below zero degrees! Destination therapist: Beauty life on board a cruise ship. Destination Therapist Dream Career – We all need this.